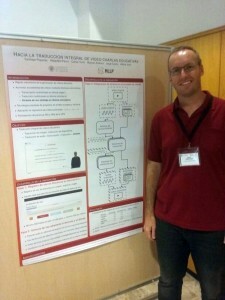 IN-RED 2017, the 3rd Spanish National Conference on Educational Innovation and Online Teaching, took place on 13–14 July 2017 at the Universitat Politècnica de València. IN-RED is a yearly forum for the exchange of teaching and learning experiences in the areas of educational innovation and online teaching within the framework of higher education. MLLP member Jorge Civera was there to present the article “Hacia la traducción integral de vídeo charlas educativas” (Towards voice-to-voice translation of video lectures), by Santiago Piqueras, Alejandro Pérez, Jorge Civera et al. The article shows the MLLP’s work on the application of state-of-the-art language technologies (automatic speech recognition, machine translation, text-to-speech synthesis) in order to achieve the complete voice-to-voice translation of educational videos. The article sparked considerable interest among the attendants, including teachers and media services staff from universities all around Spain. The MLLP was pleased to participate again in IN-RED. We look forward to new editions of the conference. Posted in All, Events, Publications and tagged IN-RED, Text-to-Speech Synthesis.